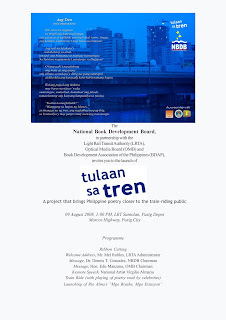 The National Book Development Board launched Tulaan sa Tren last Saturday, August 9, from 1-3 pm at the LRT Santolan, Pasig Depot, Marcos Highway, Pasig City. Tulaan sa Tren features regular readings by well-known actors of Pinoy poems in Filipino and English over the LRT's sound system during regular train runs of the LRT. It aims to make Philippine literature more accessible to more Filipinos while entertaining commuters. The project may feature literary genres other than poetry later. The project is supported by the Light Rail Transit Authority (LRTA), the Optical Media Board (OMB), and the Book Development Association of the Philippines (BDAP). The public was invited to the launching of this imaginative and laudable project.